Are you looking for new and exciting ways to attract customers, entertain viewers, or educate and inform visitors? Do you want to engage with your audience and better understand their needs and desires? Are you perhaps looking for a cleaner way to display an ever-changing bulletin of information? Make your walls work harder for you. Digital signage can be the beautiful, profitable, informative, and relevant solution to your needs. Dynamic digital signage is exciting, flexible, and ever evolving. It is way of combining technology and design in unique applications for retail, corporate communications, way-finding, education and transportation. With the many opportunities digital signage presents, it is no wonder businesses are looking to this cost-effective and powerful tool to give themselves the cutting edge. Digital signs combine graphics, video, text, sound and animation to deliver a message to the right audience, at the right time. Digital signs can suggest new products or services, inform people about programming, promote specials and events to guests, recognize staff or student accomplishments and much more. Typically a multitude or network of “electronic” signs of any size and shape, digital signage is usually tied together via terrestrial, cellular, Wi-Fi or satellite communications. It can be interactive, remotely monitored, may be used for data collection, and the sign content may be altered or adapted in real time. Studies show that digital signage can create a stimulating and more memorable environment and can influence viewer behavior in the short and long term, thus substantially increasing return on investment (ROI) and leading to greater customer satisfaction. Digital signage can provide an interactive customer experience using a touchscreen display interface which can integrate QR codes, SMS message marketing, directories, and wayfinding for conventions, malls, transportation hubs, campuses and other large venues. Viewers, in search of the information relevant to them, are exposed to promotions, advertisements, and information through their interaction with the sign. When are digital signs used? Digital signage can be an incredibly effective tool in advertising. The retailer or advertiser has the option to alter or schedule the appropriate information on the sign at will depending on changing needs, demographics, times of day, week, season, or promotion. The network of signs can be managed from one central location, and provides an interactive environment for the customer. For instance, a business can automate an in-store screen that displays their Instagram feed, promoting specials, events, and product details and prompting customers to follow and engage even after they’ve left the physical store. Furthermore, touch-screen feedback collections systems can help a retailer or bank better understand customer needs and wants. The value of graphics and dynamic, moving content is immense for audience impact and impression, and can greatly increase sales, revenue, and repeat customers. Let that sign be your silent salesperson. Digital signage is ideal for applications where the information is always changing. Corporate offices, residential buildings, schools, colleges, universities, libraries, museums, clinics, real estate offices, waiting rooms and lobbies tend to have a space dedicated to disseminating information. Way-finding and interactive touch-screens can create a pleasant and painless engagement with these environments. A digital kiosk in the lobby, for instance, can serve as a concierge, a point of gathering, and an information hub all at once. Rather than a cork board or a bulletin wall with layers of paper cluttering the space and needing constant weeding, why not transition to a clean digital display or interactive directory? Dynamic digital screens can be a great way to exhibit photos from graduation or the sports Hall of Fame, welcome messages, and directions. Additionally, cycling the weather, news feed, social media updates or entertainment can provide the illusion of decreased wait time in a lobby or waiting room for a clinic, chiropractor, dentist’s office, or salon. Displays can be wall-mounted, hung from a ceiling, freestanding, arranged on a table top, counter top, made into a lapel pin, used in meeting room identification, and can be located indoors or outdoors. Budget and creativity are the only limiting factors when it comes to digital signage. Signs can be as small or as expansive as necessary for event, exhibition space, convention, music venue, stadium, theater, club, or festival purposes. Wayfinding, digital posters, tiled video walls, tickers, directions, in-show advertising, stand displays, agenda displays and schedules are common applications, but the possibilities are endless. Digital signage can help transform a simple hotel room TV system into a more engaging experience with the guest, creating memorable stays, higher reviews, and increased revenue. Whether it’s connecting the viewer to events inside the property as well as in the outside world, recommending local restaurants or tours, or sharing information about the locale – there are many applications for digital signage in your hospitality business. Interactive way-finding displays in lobbies and entranceways can make navigating an unfamiliar environment enjoyable and easy. Many restaurants, cafes and bars are updating their menu boards to creative digital displays, interactive entertainment systems and online ordering. Digital displays are a great way to communicate local or seasonal ingredients, specials, happy hours, upcoming events and fund-raisers, infotainment, and particulars about community engagement and venue history. Create customer loyalty and engagement by going beyond media sharing and asking customers to create content for you. An in-venue social marketing display can transform customers into loyal promoters, and has the potential to reach thousands of new patrons. Digital media can make a strong impact and impression on the viewer, and can create a fun, friendly and welcoming environment to which they’ll be happy to return again and again. 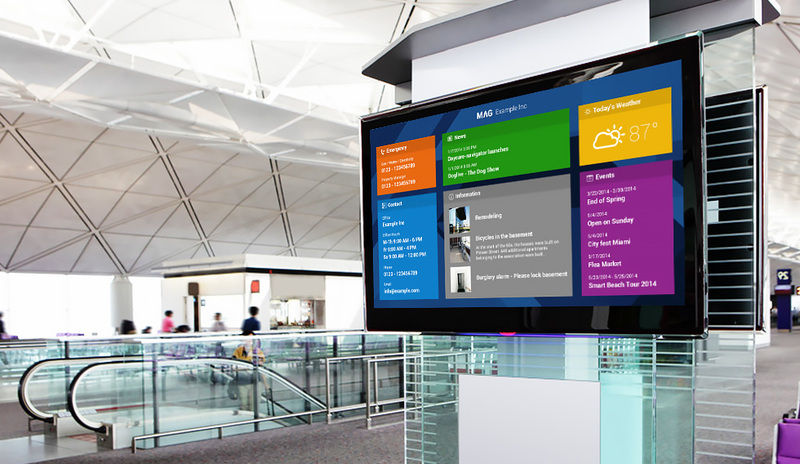 Ticket kiosks, food courts, retail and gift shops and common waiting areas with screens and video walls make up just a few of the digital signage possibilities in airports, bus stations, train stations, docks and mass transit hubs. The ability to change information in real time as needs arise and to tailor information to the specific time, season or emergency event is what makes this technology so alluring to industries in which nothing stands still. Nola Sign Shop can help you design, implement, install, and maintain the perfect strategy for your digital sign needs. Whether your goals are brand building, customer experience and entertainment, ad revenue generation, way finding, or pretty much anything else, we can help. The sky is the limit. We offer a wide range of display shapes, sizes and resolutions all perfectly designed for your needs. Our goal is to find you the best mix of ease of use, cost, flexibility, expandability, and interactivity. From content creation, scheduling, hardware installation, and storage to network management, our technical support and design team will help make digital signs work for you.